Historic buildings, great peaks, discounted children's lift tickets; something for all ages in this legendary ski haven. Aspen, Colorado is the ideal skiing destination. There’s a choice of four mountains within a 10-minute shuttle ride of town, offering something to please every member of the family, no matter what the age or ability. If I had to break a leg skiing somewhere, Aspen would be my pick. Like my non-skiing relatives, I could happily hobble through the 40 art galleries, lingering over prints, paintings and sculptures, then rest my leg and sip a lattÃ© in a chic bistro or two before I limped off again to browse through the dozens of fascinating boutiques tucked into perfectly preserved historic buildings. Like their grandparents, I’d be forced to sit on the sidelines while the kids tried snowshoeing and ice skating on the town rink, but I certainly could enjoy a hot air balloon ride over the mountains or a dinner sleigh ride through the snow. 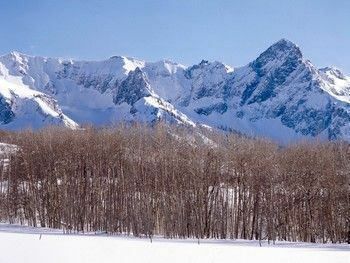 But the best reason to go to Aspen, of course, is to ski some of the country’s most spectacular peaks. Aspen Mountain is a few steps from Aspen village, and its steep faces and thigh-pounding mogul runs are for advanced-intermediate and expert skiers only. Beginners can hop the free shuttle over to Buttermilk, a gentle, friendly mountain next door, while the entire family — grandparents, parents and the kids — will adore Snowmass, a giant snowy paradise for all levels, and teens will especially like Aspen Highlands, the snowboarders’ favorite just down the road. One lift ticket covers all four mountains, but it’s one of the priciest lift tickets around. However, Aspen caters to teens and children 6 and under, and seniors 70+ ski free. Luxury lodging is easy to find, but if your budget doesn’t permit spending your monthly house payment on a single night’s stay, try the Mountain Chalet at 333 E. Durant Avenue ( 970/925-7797, 800/321-7813), an easy walk to Aspen Mountain, the shuttle stops in town where more affordable lodging choices are available. A cute little ski town with Big City sophistication. Ample recreation for the non-skier, plenty to ski and ride for the winter sports fanatic.